On December 4, Secretary General of the Palestine Liberation Organisation (PLO) Saeb Erekat praised Canada’s commitment not to follow in the footsteps of US President Donald Trump’s administration by transferring its embassy from Tel Aviv to Jerusalem. But there is little worth praising here. Respecting the internationally-recognised status of Jerusalem is legally-binding commitment to international law. The fact that the US chose to violate the law, hardly makes the opposite act heroic in itself. The Canadian government that is keen to present itself as a model, neoliberal, progressive country, even the antithesis to the US’ hawkish policies, voted against a resolution that calls “for intensified efforts by the parties… to conclude a final peace settlement”. Obama has deported 2.5 million immigrants, compared to the 2 million deported by his predecessor George W. Bush, he dropped more bombs and did his utmost to bail America’s most corrupt financial institutions, yet somehow many liberals thought of him as the ideological marriage of Che Guevara and Malcolm X, with the refined eloquence of James Baldwin. Canada’s Prime Minister Justin Trudeau, seen as the “human face of neoliberalism”, is an even more successful brand than Obama. Unlike the former US president, there is very little discussion about Trudeau’s undeserved credentials. While positioned as the political opposite of former conservative Canadian Prime Minister Stephen Harper, they are both committed to the ideology of neoliberalism. Trudeau’s “human face of neoliberalism” is nothing but a carefully-constructed mask meant to hide the hypocritical and militant policies that Canada continues to lead. And before the Trudeau fan club impulsively reacts to the above assertion, marvel at this fact: In the first 18 months of his mandate, Trudeau voted against 16 UNGA resolutions that were critical of Israel. Let us consult the facts. The page on Trudeau government’s website entitled, “Canadian Policy on Key Issues in the Israeli-Palestine Conflict” is almost an exact replica of Harper’s, with one notable exception. On Trudeau’s page, his government recognises “experience of Jewish refugees from the Middle East and north Africa, who were displaced after 1948”. The above is a misconstrued version of history that has been injected by Zionists whenever the rights of Palestinian refugees, who were displaced by Jewish militants during the 1948 ethnic-cleansing of Palestine, is brought up. The very first ”key issue” for Trudeau’s government is “Support for Israel and Its Security”. Trudeau makes the claim that his government’s assessment of UN resolutions is guided by “its merits and consistency with [Canadian] principles”. Harper, seemingly, defied these “principles” on numerous occasions, notably when his government voted against UN Resolutions critical of Israel: 66/17 in 2012, 67/23 and 68/15 in 2013 and 69/23 in 2014. Aside from carrying on with the same anti-Palestinian attitude at the UN, on November 24, 2015, the Trudeau government even voted against UNGA Resolution 70/15, which reaffirmed the “illegality of the Israeli settlements in the Palestinian territory occupied since 1967, including East Jerusalem”. This should not come as a surprise, though. Hypocrisy and doublespeak has become a prominent feature of Canada’s foreign policy. Take Ottawa’s stance on terrorism, for example. In its “key issues” on Israel and Palestine, the Canadian government “condemns all acts of terrorism”, but it later qualifies what that means in actuality. “Canada has listed Hamas, Palestinian Islamic Jihad, Hizbollah, Al Aqsa Martyrs’ Brigades and other groups as terrorist organisations,” it elaborated. Not only did it fail to link any Jewish group as terrorist, or, at least, emphasise the need to prosecute war criminals, in this case Israeli leaders, it linked Palestinians and Arabs only to acts of terrorism. According to this logic, only Arabs seem capable of carrying out acts of terror. 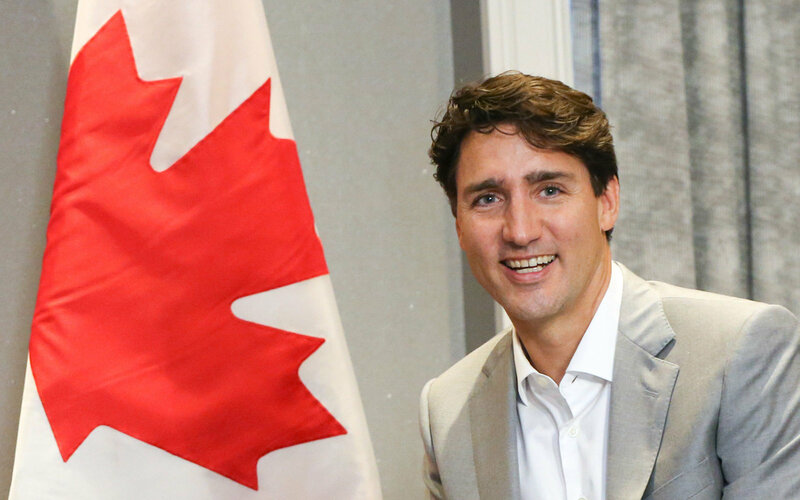 In 2016, with much personal enthusiasm by Trudeau himself, the Canadian parliament overwhelmingly voted in favour of a motion that condemned the Palestinian Boycott, Divestment and Sanctions movement (BDS). Since then, Trudeau has made his anti-BDS policy a fixture in his government’s attitude towards the Palestinians.